Explore the busy city of Kathmandu. Walk around the historical Basantapur Durbar Square. Learn about the interesting history and tales of temples around Kathmandu valley. Try out Newari dishes and mo: mo of narrow streets of Kathmandu. 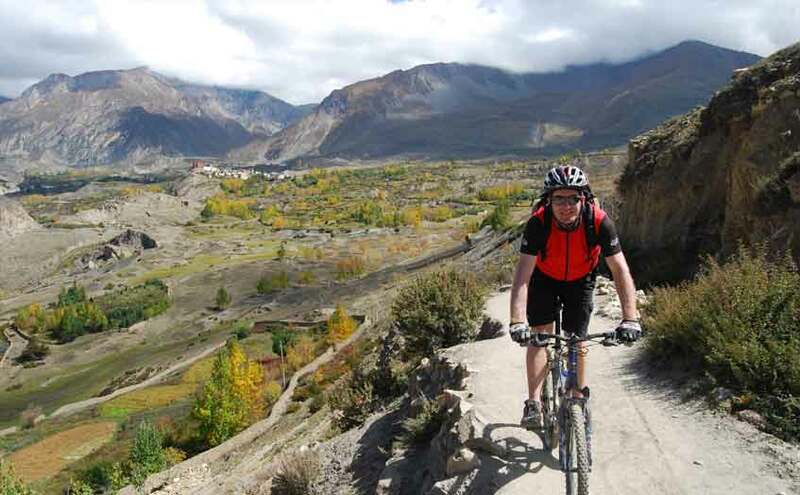 And in Lower Mustang Cycling Adventure – drive alongside the rivers and pass villages, ancient buildings, and temples. Ride in steep roads and straight jungle trails. Try out different food of different culture. Explore lakes and desert of Nepal. Crossover rivers and streams using suspension bridges. Ride with the wind and the river. Get drunk on local alcohol and make new friends. Roam in the streets of Pokhara and dance to the songs you had never heard before. Arrive at Kathmandu at any time, recommended time is before 1800. A Red Carpet Journey transfer vehicle with your trip manager will receive you at the airport, or at any designated arrival point. You will then attend a small tour briefing session at your hotel, led by your trip leader. This is the perfect time to ask any last-minute questions regarding what to expect on the upcoming trip. Your leader will also inform you of any last-minute changes and adjustments to your trip (if any). Overnight stay in a hotel in Kathmandu Kathmandu altitude: 1300 m ASL Pro tip: If you arrive at Kathmandu early, you can explore the bustling streets of Thamel, walk around the ancient market of Asan or maybe even go out to the cinema to watch a Nepali film! Your tour manager can help you make the arrangements. You will meet your trip leader at the hotel early in the morning and set out towards Pokhara 200 km away. Drive for 8 hours. You will be driving along excellent hill roads alongside turbulent Trishuli, Marshyangdi and Gandaki rivers, villages, ancient buildings, coffee shops and plenty of attractions along the way. Overnight stay in a hotel in Pokhara Pokhara altitude: 1,600m ASL Kathmandu – Pokhara distance: 200 km Pro tip: You can also take a 25 minutes’ flight to Pokhara (at an extra cost) as opposed to 8 hours of driving. This will leave you plenty of time to have a look around Pokhara, and get comfortable with riding your bikes in the locale. You will go get your bikes, have a brief inspection and discussion with your leader, get the necessary medical and technical kits, attend a demo on the bikes, and finally start the first leg of the upcoming trip. Load your bikes on your vehicle and drive for 3 hours through some twisties to the riverside town of Beni. Then you will get on your bikes finally and ride to the ancient village town of Marpha. Today you will officially enter the Mustang (Lower) region, and that means you will start encountering a dry and rocky terrain; Mustang is a rainshadow area receiving little rainfall at all times. The ride to Marpha will follow off-road jeep trails alongside the Kali Gandaki river. The ride will be a rocky and exhausting one, but amazing landscape, fluttering Buddhist prayer flags and strong winds will be your constant companions. Overnight stay in a lodge in Marpha Beni altitude:899m ASL Marpha altitude:2650m ASL Pokhara - Beni distance: 95.3 km Beni - Marpha distance: 80.8 km Pro tip: Marpha is famous for its apple orchards. In season, you can try out freshly harvested apples and various apple delicacies. Regardless of the time, if you are in Marpha, it is recommended not to miss out on Marpha (the local wine made out of fermented apple) and Sukuti (sun-dried apples). You will wake up early, have a local breakfast, get on your bikes and ride to Kagbeni, a little scenic village on the banks of the Kali Gandaki River. Kagbeni is also the entry point into the restricted Upper Mustang region. After a short stay and exploration at Kagbeni, ride on to Muktinath. Muktinath or Muktinath Temple is a popular pilgrimage spot for both Hindu and Buddhist followers, and the area has a unique religious ambience with a jaw-dropping Himalayan backdrop. 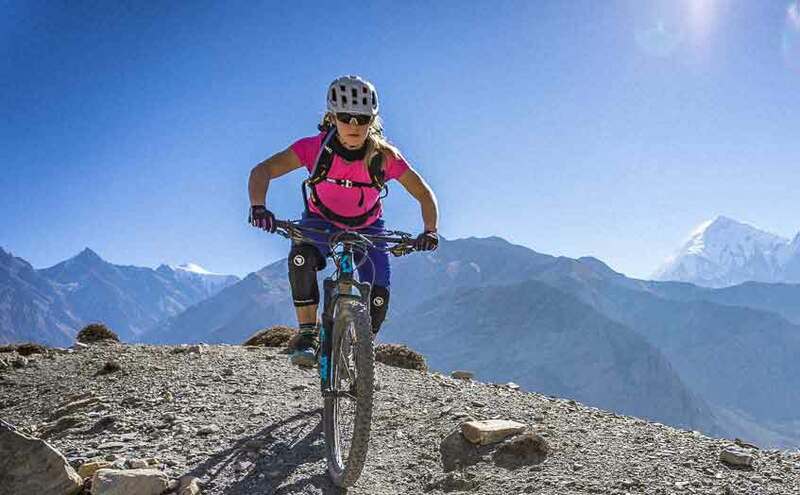 Overnight stay in a hotel in Muktinath Muktinath altitude: 3710m ASL Marpha – Muktinath distance: 31 km Pro tip: The day’s ride will be through extremely windy terrain. The combination of dry sand and strong wind will make ride unbearably windy and dusty occasionally. It is recommended to bring along a scarf, mask or a parka with you to battle the elements in Mustang. Start early and drive to Tatopani Hot springs, while making an enroute stop at Rupse waterfall. This will be a relatively easy ride with lots of downhill trails, passing through forests and often, through motorable roads. Overnight stay in a lodge in Tatopani. Tatopani altitude: 1050 m ASL Jomsom – Tatopani: 47 km Pro tip: Tatopani has a couple of natural hot water pools. We recommend going in for a dip into the relaxing water after the day’s ride. The hot water has rejuvenating benefits, so a short stay will benefit your health. You will spend this day at leisure. A half-day sightseeing program around some of Pokhara’s most popular sights is arranged. Visit World Peace Pagoda, Fewa Lake, Mountain Museum and the Bindyabasini Temple. If you are interested, you can also take the bikes along for a morning or an evening ride to Pame valley, the mostly uninhabited but beautiful northern side of Fewa Lake. Overnight stay in a hotel in Pokhara Pro tip: Since you have the entire day to yourself, you can participate in various leisure and fun activities like paragliding and mountain flights, white-water rafting, zip flying and bungee jumping, boating in the lake or simply exploring the vibrant lakeside streets of Pokhara. Pokhara lakeside is one of the few places in Nepal where there is a nightlife. Explore the shops, bars and various clubs in the area and have fun. Today, you leave your bikes and drive back to Kathmandu 8 hours and 200 km away. Overnight stay in a hotel in Kathmandu Pro tip: The drive back to Kathmandu is pretty hectic (8 hours!). If you feel up to exploring the hills, forests and like driving alongside rivers on wobbly tarmac, then the drive is for you. If not, you might be better off taking the 25-minutes’ flight option from Pokhara to Kathmandu, at an extra cost. The perks of arriving in Kathmandu fast is that you get extra time to spend in Kathmandu. Your trip manager will meet you at your hotel and drop you off at the airport in time for your flight back home. If you are not into joining a group of people you have never met on a multi-day journey, or you want that bit of privacy with your family and friends, ourprivate trips are just for you. Choose one of our group departure dates and book your seat. Be a part of a fun group led by one of our experienced trip leaders. This trip focuses on value for money and on the interactions with people from all over. If you value privacy above all other things, this trip is not for you. If one of our group departures do not suit your calendar, or if you value privacy above everything else, choose our private trip option. Though the trip may not provide value for money as the fixed departures do, this trip will be organized entirely for your or your own group, on the date of your choosing, with specialized care provided to your requests. Please use our private trip calculator to know the costs. – On fixed departure trips, accommodations at Kathmandu and Pokhara will be organized at 3-star or similar hotels/resorts with all modern amenities. On private trips, three accommodation options (standard, deluxe and premium) will be provided as choices. Accommodations will be arranged as per the chosen standard during booking. Read our accommodation standard article for more info. Accommodations during the ride, on both fixed departure and private trip options, will be extremely basic, tea-houses and small lodges with sleeping and basic meal facilities. Modern amenities are usually absent, as is the hallmark of remote mountainous areas. – All accommodations will be arranged on double and triple sharing basis, depending on the group sizes. If you are booking solo, our team will arrange a room sharing for you with a fellow traveler of the same gender. A single room can also be availed on a supplementary basis. The single supplement option will be provided as an add-on during check-out. – Trips will start and end at the designated joining points in Kathmandu. The joining point will be an easily accessible hotel in the downtown areas within an hour’s drive from Tribhuvan International Airport. The specific names and address will be provided after booking. A trip orientation program and meeting, starting from 1900, will be conducted at the joining point on Day 1, which the participants are recommended to attend. – All trips, both private and fixed departures, do not include airport pickup & drop facilities on the base option. However, these options can be selected as add-ons during check-out. 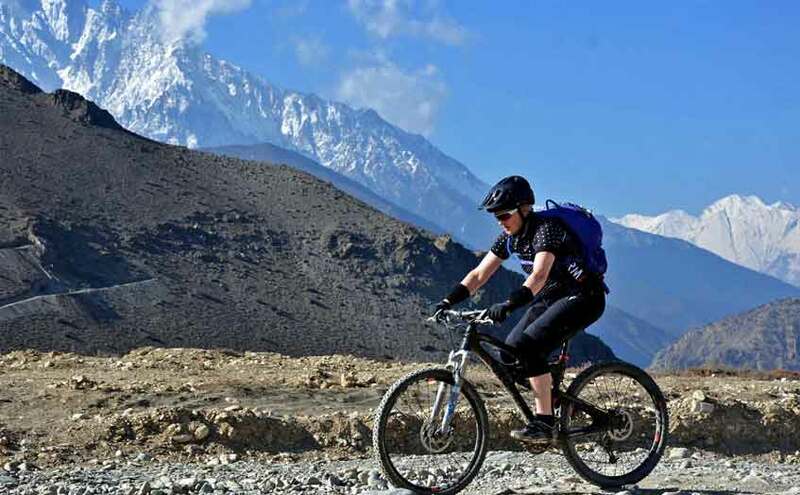 Lower Mustang cycling adventure (1o days) has a 4-star physical rating. please click here to know more about the physical ratings of our trips. This trip will lead you through difficult terrain in higher altitudes (above 3000 meters). cycling duration will be an average of 6 hours a day, through forests, off roads and mountain trails.one is expected to push and carry the bike in rough terrain. please ensure that you are physically fit to go on this trip before booking. this trip follows one of the extreme routes and geographic conditions. prepare yourself physically as well as mentally before booking this trip. -please ensure that you have enough experience and expertise on riding a mountain bike on rough terrain. -you will be given chance to adjust your bike according to your preferences. -please take care and maintain the bike during the trip as it will be difficult to carry the extra weight of the bike instead of riding it. -it is important to carry all the basic essentials so that you do not get stuck because of the unplanned packing. -for the essentials, you need to consider bringing click here. Trouble selecting the style that suits you the best? Get in touch.